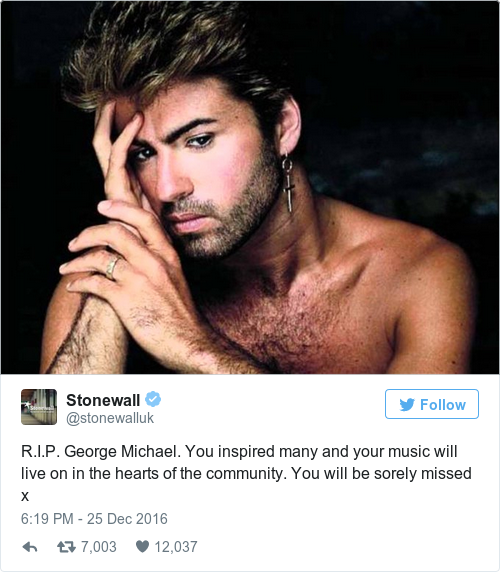 FELLOW MUSICIANS, POLITICIANS and LGBT campaigners have been paying tribute to George Michael, following the pop superstar’s death at the age of 53. His partner, Fadi Fawaz paid tribute to Michael, saying that he found the singer in bed after passing away. Details of Michael’s death emerged yesterday. “It is with great sadness that we can confirm our beloved son, brother and friend George passed away peacefully at home over the Christmas period,” his publicist said in a statement last night. Thames Valley Police said the ambulance service had attended a property in Goring in Oxfordshire, where the singer lived, at 1.42pm yesterday and a 53-year-old man was confirmed dead at the scene. “At this stage the death is being treated as unexplained but not suspicious. A post-mortem will be undertaken in due course,” the police said. “I am in deep shock. I have lost a beloved friend – the kindest, most generous soul and a brilliant artist,” the British star wrote. His former Wham! 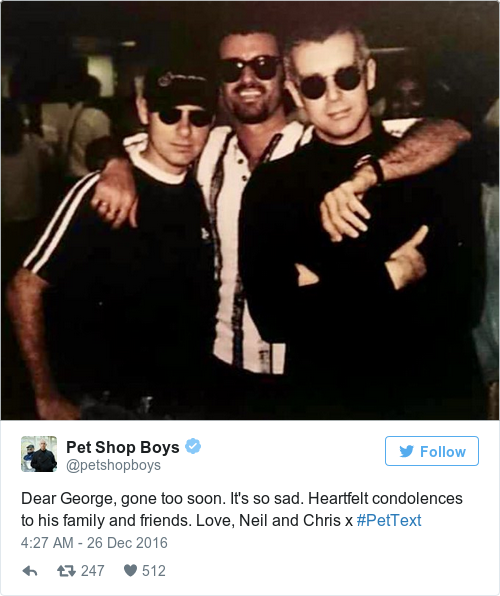 bandmate Andrew Ridgeley said on Twitter that he was heartbroken at the loss of his beloved friend. Earlier this month it was also announced that producer and songwriter Naughty Boy was working with Michael on a new album for next year. Michael was best known for his 1980s hits Last Christmas, Freedom, Careless Whisper and Wake Me Up Before You Go Go, but his career spanned more than three decades. His last album Symphonica (2014) rose to number one in the charts. “2016 – loss of another talented soul. 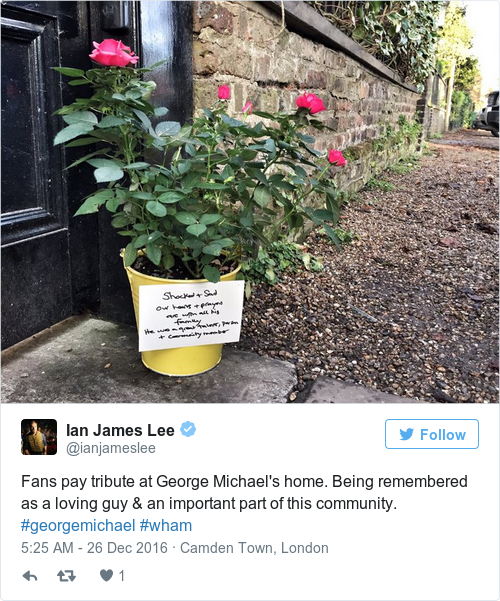 All our love and sympathy to George Michael’s family,” the band Duran Duran said on their official Twitter account. I can’t believe it. Such an incredible singer and a lovely human being, far too young to leave us. “I am thinking of @GeorgeMichael‘s family, friends and fans right now. He was so loved and I hope he knew it because the sadness today is beyond words. Devastating. What a beautiful voice he had and his music will live on as a testament to his talent. I can’t believe he is gone. I hope the Buddha will hold him in his arms. NMRK. Following years of speculation over his sexuality, Michael came out as gay in 1998 after being arrested for committing a ‘lewd act’ in the public toilet of a Los Angeles park. Email “'I will never stop missing you': George Michael's partner found him 'peacefully in bed' after his death”. Feedback on “'I will never stop missing you': George Michael's partner found him 'peacefully in bed' after his death”.